Translation, proofreading and managing of multilingual websites often requires tedious coordination processes and manual data handling with translators and agencies. Delays in the launch of new products and services are often the result. 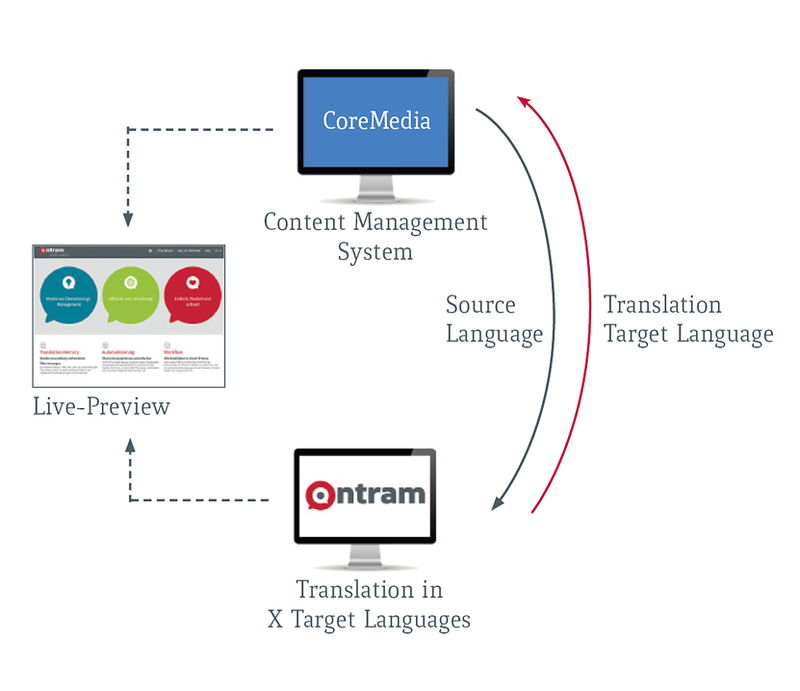 ONTRAM connects to CoreMedia via WebServices and is integrated into the editorial process of the content management system. Editors easily create translation jobs with a couple of clicks directly in the editor of CoreMedia and tranfer the text to be translated to ONTRAM. ONTRAM takes over the workflow-based management of the translation process, allowing translators to work within the web-based editor of ONTRAM. The translation and adaptation of texts is carried out directly in the browser, so that the core application and user interface stay the same for all file formats. The translation memory and terminology module of ONTRAM take care of efficient and quality-assured content. A special plus is the integrated, dynamic live preview to control text length. The editor then accepts the translated texts from the translation management system which are automatically sent back to the correct location within the content management system. The publishing process is triggered in CoreMedia. The integration of CoreMedia and ONTRAM was done with the help of the implementation partner arvato Systems GmbH (former nionex).